The rally cry goes on. 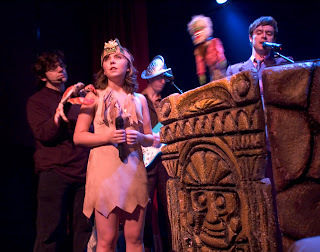 Tonight, The Bell House hosts Fight for Your Right to Coney!, a benefit for the People's Playground featuring the theatrical pirate rockers Jollyship the Whiz-Bang (pictured, photo credit: Dana Gramp), self-described as a "pyrate puppet rock opera constorium," as well as punk band Kissy Kamikaze, surf punk band Tyburn Saints, and an array of carnivalesque performers. Also that night, DJ Ole will be spinning. Presented by boardwalk babe Lola Staar, the benefit proceeds go towards Save Coney Island, a grassroots organization committed to preserving the spirit of Coney Island and preserve historic structures and the amusement district. Tickets are $12 in advance, $15 day of the show. $30 VIP admission includes a Save Coney Island tee shirt and gift bag. The Bell House is located at 149 7th St. For more information, go here. On April 11, the call will be picked up by Southpaw, when the Park Slope venues hosts another Save Coney Island benefit, this year with performances by Gato Loco, 357 Lover, and Les Sans Cullotes, as well as a slew of burlesque beauties, including Nasty Canasta, Little Brooklyn, Miss Coney Island 2008 Gal Friday, Gigi La Femme, The World Famous Pontani Sisters and the "Burlesque Mayor of NYC" Jonny Porkpie, among other burlesque and sideshow acts. The night will be hosted by The Great Fredini, Miss Astrid, and The World Famous Bob, as well as feature DJ's Huckwild, Fersh Prince of Darkness and Bill Coleman, raffles, prizes and drink specials. Tickets are $12 in advance, $15 at the door, for the 8 p.m. show. Southpaw is located at 125 Fifth Avenue. 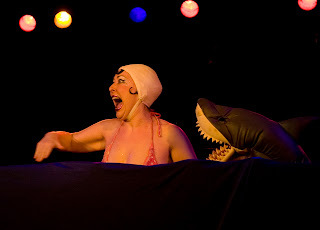 Photo: A burlesque performer hams it up at last year's Save Coney Island benefit at Southpaw. Dine in Brooklyn ends this Thursday, April 2, so don't miss out on your chance for dining deals at over 200 Brooklyn restaurants. That number a tad daunting? The borough president's office breaks it down by neighborhood, so you can find deals near you (sorry Red Hook). The Web site Serious Eats also talks with six Brooklyn bloggers on their picks: Dumbo NYC, Blondie & Brownie (while there, check out their coverage of this weekend's Bacon Takedown at Williamsburg's Radegast Hall & Beer Garden), Brooklyn Based, F---cked in Park Slope, Eat It: The Brooklyn Food Blog, and the Cobble Hill Blog. Have your own to throw in the mix? Let us know in the comments section. The New York City music community is abuzz with news that, after the popular McCarren Park concert series came to an end last August, North Brooklyn will be home to even more concerts, brought to you by the Pool Party founders Jelly NYC, this summer at the East River State Park. The park, which stretches from North 7th to North 9th Streets on the Williamsburg waterfront, became the first public space in Williamsburg to enable access to the water’s edge when it opened last Memorial Day. According to The Trip Wire, the shows kick off July 12 and run through August 30 for eight total. Last year alone brought The Liars, M.I.A. and Sonic Youth to Brooklyn for the McCarren Park Pool series. Who's on your wish list to rock out on the waterfront? 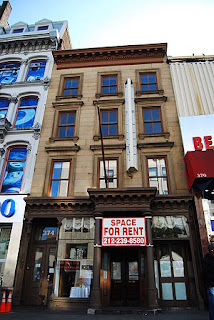 Arby's fans may be licking their lips over the news that the fast-food chain will be setting up shop in Downtown Brooklyn, but the news has preservationists roiled because the site is the former home of Gage & Tollner, which closed in 2007. The story after the jump. It’s an historic downward spiral that has Brooklynites licking their lips, especially if they’re fans of roast beef sandwiches and popcorn chicken. It was announced last week that the Arby’s fast food chain is taking a stab at downtown Brooklyn’s restaurant market and will be slinging roast beef slices from the former Gage & Tollner restaurant, a historic neighborhood restaurant on Fulton Street. After serving foodies in downtown Brooklyn for well over a century, Gage & Tollner shut its doors in 2004. A TGI Friday’s opened in the landmarked spot near Smith Street, but closed down in 2007. This January, owners of the property finalized a lease with Arby’s franchisee Raymond Chera, who hopes to open by this summer. Yet it’s not an easy feat to open a fast food restaurant in a landmarked building. While neighborhood history buffs and landmark purists may balk at the idea of a fast food chain sprouting up in a building that once welcomed stage and screen legends Jimmy Durante and Mae West, Chera says that he only intends to make modest changes. The changes were still being mulled over by the city’s Landmarks Preservation Commission as this paper went to press. A public hearing, where members of Community Board 2 would be able to weigh in on Chera’s plan, has yet to be scheduled. Chera believes that the changes he plans to bring won’t ruffle any feathers. Reaction to the Arby’s -- the first to open in Brooklyn -- was mixed, with most diners either voicing excitement or shrugging their shoulders. A few bemoaned the fact that the new eatery will be opening in the Gage and Tollner site, which they said was a piece of Brooklyn history. Some, however, are welcoming Arby’s with open arms. “If you think tough economic times have slowed the tide of new business in Brooklyn, I say horseradish! Hello Arby’s!” he said. Chera said that his Arby’s franchise will begin hiring at the Gage and Tollner site in the next few weeks. The first time Still Flyin’ played in Brooklyn, the bouncers wouldn’t let all the band’s members in at first because it was so crowded at Union Hall. When the 15-person reggae-inspired supergroup returns to the Park Slope venue this April 3, this time to play on the stage, they’re prepared. “I figure if we’re there early for sound check and don’t leave we won’t run the risk of not being allowed back into our own show,” says singer Sean Rawls, who formed Still Flyin’ after writing the song “Never Gonna Touch the Ground.” He didn’t even think that many people would be interested when he asked everyone he knew to join the band, but then 15 people showed up at the first rehearsal, “and that’s when I knew we were going to be one of those ridiculously large bands,” says the musician. Since forming in 2004, the group has played in their home base of San Francisco, as well as traveling the US. Earlier this year, the band returned from a world tour, traveling to Europe and Australia, all 15 in tow and gaining a following along the way. No, that isn’t a typo. The band’s reggae-pop sound, full of hand claps and ska-flavored guitar riffs, they like to call “hammjamm,” “jamm” because the songs are rather concise and don’t amble on indefinitely, and “hamm” added in for good measure to prevent further classification and confinement to any genre. Their party atmosphere on the record naturally translates to the stage for energetic, manic live shows. 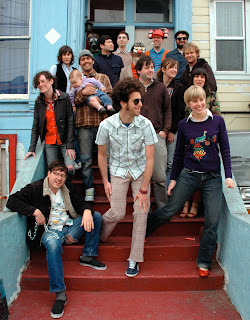 When their current East Coast tour brings the band to Union Hall, in addition to the core lineup, whose rotating cast includes members of the bands Track Star, Aislers Set, Ladybug Transistor, Love Is All, Maserati, and Red Pony Clock, they’ll be joined by “extra spiritual members for the heck of it,” says Rawls. For those who miss the Union Hall show, or want to keep flyin’, the band will also be piling onto another local stage, playing Manhattan’s Cake Shop on April 5. After their week-long East Coast jaunt, it’s the release of the band’s debut album, out April 21 and fittingly called “Never Gonna Touch The Ground,” the name of the single that initially brought the band together. Still Flyin’ play Union Hall (702 Union St.) on April 3 at 8 p.m. Tickets are $10 and are available for purchase at www.ticketweb.com. For more information, go to www.unionhallny.com or call 718-638-4400. For more on the band, go to www.myspace.com/stillflyin. You never know what's gonna happen at Galapagos Art Space in DUMBO. One week it's can can dancers, another it's aerialists. On weekends, they go fly kites. March 29 brings the Great White Way in a star-studded event to raise money for the not-for-profit Brooklyn Young Mother's Collective, where you can see Ana Gasteyer sing, sans Will Ferrell. Broadway comes to Brooklyn this month when DUMBO’s Galapagos Art Space hosts Broadway Under the Bridge, a benefit for the Brooklyn Young Mothers’ Collective, a not-for-profit provides low-income young mothers with the tools to develop leadership skills and the encouragement to develop a plan to finish school education and obtain self-sufficiency. 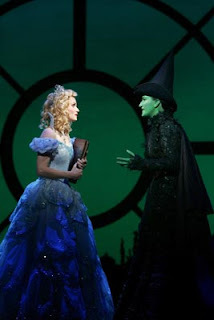 Headlining the March 29 event are Ana Gasteyer of “Saturday Night Live” fame and Broadway blonde Kate Reinders, who will be reunited after starring in the Chicago run of Wicked as Elphaba and Glinda, respectively, in 2006. Also joining the two are other stars from the Great White Way, including Sarah Litzsinger (“Beauty and the Beast”), Megan McGinnis (“Little Women”), Cathy Trien (“Gypsy”), Christopher Sloan (“Cabaret”) and Jessica-Snow Wilson (“Spelling Bee”). The cabaret-style benefit will feature the performers in Broadway songs of friendship, family and support, as all of the performers have previously worked with Reinders on Broadway or off. Before the show, Reinders, along with New York City-based artist Robert S. Greenberg, will be at a wine and cheese reception for Greenberg’s “Frog Skins,” an exhibition of transparent layers of acrylic paint and gold leaf depicting the translucent skins of endangered tropical tree frogs. Greenberg’s work is steeped in the significance of geography as he attempts to educate viewers on his subject matter, and this exhibition is no exception. The subject of tree frogs also makes for a vivid, colorful one. When the stars take to the stage for the main event, guests are also invited to purchase VIP private seating in one of Galapagos’s “pods,” individual sections of seating that are separated by the venue’s reflecting pool of water, for 10 people at $1,000. Otherwise, tickets are $75 for the performance and $125 for the performance and reception. Though DUMBO isn’t exactly the Theater District, the Broadway event is very much Brooklyn, with both Masimore and Gasteyer calling the borough home, and the BYMC, as the name suggests, located here in Park Slope. The Broadway Under the Bridge Benefit will be March 29 at Galapagos Art Space (16 Main St.), wthi a reception at 7 p.m. and the performance starting at 7:30 p.m. Tickets are $75 for the performance only, with reception/performance tickets available for $125 and VIP 10-person s event seating is available for $1,000. The night will also feature a raffle. For more information, and to purchase tickets, go to www.galapagosartspace.com and nycharities.org. For more on the Brooklyn Young Mothers’ Collective, go to www.bymcinc.org. Grillin' on the Bay, an annual BBQ competition and fundraiser for the St. Mark School in Sheepshead Bay organized by Bay resident Robert Fernandez, makes its annual return on April 3, as barbecuers from all over the country will be grilling up pulled pork and chicken, all for a good cause and friendly competition. Authentic BBQ can be found in Brooklyn on a daily basis, and some of the best establishments in the borough will be competing in the cook-off: Kings County BBQ on Quincy Street off Bedford Avenue in Bedford-Stuyvesant, serving Kansas City-style fare out of their orange truck, and the Fuggetabouit team of Waterfront Ale House on Atlantic Avenue, which happens to also be Fernandez's favorite place for BBQ in the borough. What are your favorite places for BBQ in Brooklyn? And for more on the competition, see after the jump. Some of the best grillers from Brooklyn and beyond will converge on Sheepshead Bay to turn up the heat and battle over their barbecues at the fourth annual Grillin’ On The Bay. On April 4, the St. Mark School will host the cook-off, a fundraiser for the school created by Sheepshead Bay resident Robert Fernandez. The local event, New York City’s original barbecue contest, typically draws teams from all over the country as they compete in four grilling categories: chicken breast, fish, pork and chef’s choice. Among those from the borough competing are Mike Rosen and Mike Danza, who fittingly make up the team Smokey Mikes, as they make their third appearance at the competition. Danza introduced Rosen to the competitive side of barbecuing several years ago, and the two have been behind the grill together ever since. Spending the summers barbecuing and working on different recipes throughout the year, the two Mikes like to keep it simple, working with a basic Weber grill for their equipment and forgoing the good luck charms and flag poles that other teams tend to set up on their site during competitions. Another team with Brooklyn roots, the Beer Belly Smokers, competing in their fourth Grillin’ On The Bay, likes to keep it simple as well. The team does embrace the cheese-factor a bit, with the four members – including Ralph DeRosa, Mike Rynne, Steve London and Tommy Joyce – and their families sporting tee-shirts bearing the name Beer Belly Smokers. And yes, the men do sport beer bellies as well. “It kind of goes with barbecuing,” says Ryan. The team met over a grill, with their wives bringing the group together, and they keep coming back to the competition not just for the prospect of victory, but for the fun of it. New to Brooklyn since setting up shop this past fall, the Kings County BBQ Truck on Quincy Street off Bedford Avenue in Bedford-Stuyvesant will also be competing with their Kansas City-style barbecue, as well as the Fuggetabouit team of Waterfront Ale House on Atlantic Avenue. 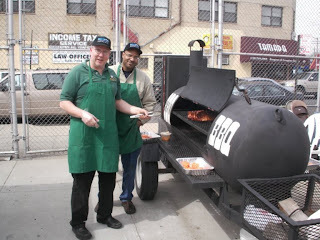 Beyond Brooklyn, other teams among the more than dozen signed up that will be rolling their grills into Sheepshead Bay include the returning grand champion, Smoke in Da Eye, from Garden City, Long Island, as well as the first year grand champion, Purple Turtle Caterers of Connecticut, led by St. Mark School alum Greg Hunter. Big names in the BBQ competition world that will also be testing their chops include iQue, featuring Andy O. C. Husbands of the award-winning Tremont647; Josh Ozersky of the Feedbag, formerly of Grub Street, with Robbie Richter, the former Pitmaster of Hill Country; Born Again BBQ featuring Kevin Lincoln founder of the New York BBQ Lover’s Meetup Group; and Atom’s Ribs featuring Matt Fisher, former Pitmaster of Wildwood BBQ NYC. So aspiring ace barbecuers looking to spice things up this summer, take out a notepad and learn a thing or two from some of the best behind a grill around. Judges certified by the Kansas City Barbecue Society have the pleasure of eating the offerings and will rate the meat and fish based on appearance, tenderness and, of course, taste. “Does it taste like BBQ? Do you want to eat it or not? Should it be tender or not?” are some of the things judges will take into consideration, says Fernandez. Those deemed the winners in each category get a percentage of the pool prize, with the remains going towards St. Mark School. For Brooklynites wondering how much fun it might be to watch others stand behind a grill, obsessively checking temperatures and watching over their meat, the treat is in the barbecue, which will be on sale, and contestants might hand out some of their specialties off the grill for sampling as well. Chili connoisseurs can also get in on the fun this year, and the chance at a $100 prize, with the addition of the Brooklyn Chili Smack Down. A takeoff of Matt Timm’s popular Chili Takedown, held this past February at Union Pool, the best pot will be the people’s choice, so come hungry. Grillin’ On The Bay and The Brooklyn Chili SmackDown will be April 4 at St. Mark School (East 18th Street and Avenue Z), starting at 11 a.m. with the chili sampling beginning at 1 p.m. The awards ceremony will take place at 4:30 p.m. Admission is free. BBQ will be available for purchase, as well as $10 all-you-can-eat chili. For more information, go to www.grillinonthebay.blogspot.com, email BrooklynQ@gmail.com or call 917-763-5062. Great jugglers aren’t born — they’re made. Williamsburg resident Viveca Gardiner, the producer of an upcoming festival called Juggle This! knows this maxim better than anyone. Gardiner first learned to juggle 13 years ago, at the tender age of 29 years old. She has since gone on to perform with the Big Apple Circus and the Flying Karamazov Brothers. “When it finally clicked, it was an epiphany,” she recalled. “Everything for the past 13 years is trying to keep that feeling,” she continued. And if she can do it, anybody can do it. “I have met very few people who can’t do it physically. Nobody is expected to be able to do it the first time, but most people have either psyched themselves out, or given up too early. If people put a lot of work into it, they can get a lot of fun out of it,” she said. “I know a brilliant one-armed juggler, blind jugglers too,” Gardiner added. Her upcoming event will give people of all ages — and all experience levels — a chance to learn from the best, and marvel at them too. The eighth annual juggling festival will be held at Pratt Institute’s Brooklyn campus, 200 Willoughby Road, from April 3-5. 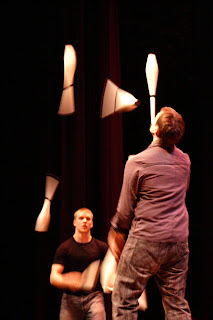 The festival will include workshops, games, and a show featuring the best juggling culled from around the globe. All events are open to the public and all, except the show, are free. Tickets for the April 4 show are $10 each, and available at Pratt’s Activities Resource Center building, and the show will be held inside Pratt Memorial Hall at 7:30 p.m. The show will feature the phenomenal German outfit called “Get the Shoe,” which combines martial arts, juggling, and storytelling. “It’s a fantastic narrative story,” Gardiner said. Other performers include the internationally renown Lin Juming, a Chinese acrobat making his North American debut. And Véronique Provencher, a brilliant performer and teacher at a juggling school in Canada. Like in previous years, juggling with sharp knives, fire, or chainsaws will be prohibited inside Pratt’s gymnasium. After all, juggling is all fun and games until someone loses a limb. The festival typically attracts 150 people each year, and the show brings in about 500, Gardiner estimated. Attending a workshop might be the best thing for a prospective juggler, she said. “Many people find it difficult if they try on their own, but its completely manageable when you get good instruction.” When taught correctly, she noted, it’s not the third ball that is the most difficult. It’s the second. Who knew? The workshops work best for ages 8 and up, Gardiner said. For younger children, there will be other activity and skill sessions available during the event, she said. Juggling materials will be available for borrow, or purchase from a wide range of vendors selling traditional-looking clubs or even a diabolo – an ancient Chinese yo-yo-esque device which is essentially a spool manipulated on a string tied to two sticks. Juggling itself is rather ancient. According to Boston College Professor (and International Juggling Association judge) Arthur Lewbel, the earliest known representation of toss juggling is Egyptian, from the 15th Beni Hassan tomb of an unknown prince, dating from the middle kingdom period of about 1994-1781 B.C. “The Staatliche Museen zu Berlin has a Terra Cotta Statue from the time of Ptolomaer of ancient Thebes, about 200 B.C., of a man with balls balanced on different parts of his body,” he states in his paper, “Research in Juggling History,” adding that pictures of jugglers appear in various medieval illuminated manuscripts. From early texts and pictures it is clear that the commonest props used for juggling were balls, knives, and torches, the professor notes. “My own juggling is about skill and sometimes beauty, and sometimes comedy. I’m not interested in danger,” she said. The festival’s schedule is as follows: Open juggling will be held at the ARC building on Friday, April 3, from 5 p.m.-10:30 p.m.; Juggling and workshops at ARC on April 4 from 10 a.m. to 7 p.m.; Workshops, juggling, and games at ARC on Sunday, April 5, from 10 a.m. to 5 p.m. The show will be held at Pratt Memorial Hall, April 4 at 7:30. For more information about Juggle This! go to http://jugglenyc.com/fest_09.html. Last spring, Sarah Lentz thought she would be celebrating the release of her long-awaited fourth album, six years in the making. After some setbacks, from financing the album to engineering it, she finally gets to do so this month, with a release party at Williamsburg’s Public Assembly on March 28. “Begin Again” is a work the musician more than once refers to as a miracle album. For without the help of fans and friends, it may not have seen the light of day. Putting three of her previous albums out on her own label, Lentz has been trying to get her latest out, full of material written since 2002. When a deal with a label fell through for her fourth album, Lentz thought that might be the end, until she reached out to her fans for some help. Asking them to purchase the as-yet unfinished album in advance, and then from generous donations in addition to that, she was able to secure enough funds to continue. Then, determined to continue to do everything herself, Lentz was stalled in the recording studio, where she didn’t have much training in. “I had some friends from music school that I kept calling for help – how do I work this machine? And so, with the help of her friends, Lentz was able to finish the album itself. Coincidentally enough, while recording the album, Lentz realized there was another miracle of sorts at work – she was pregnant with her first child. Lentz wanted to release the album before her son was born, but the timing didn’t quite work out, and now feels ready to release it. For all those reasons, Lentz found it fitting to call the album “Begin Again,” taken from the name of a song on the album. Though that track, a bare, piano-based anthem, became the album title, the one that means the most to Lentz is “Jericho,” written after a trip to New Orleans a year after Hurricane Katrina ravaged the city. Lentz also thinks it came out the “coolest,” too, with its mimicking of a New Orleans-style funeral march, with instruments slowing joining in with a solo clarinet in the “procession,” until culminating with all the voices and instruments playing together. “I want it to lift up and remind people of the joy that was in the city for so long,” says Lentz. The rest of the album showcases the musician’s steady piano work, pounding out songs influenced by folk, pop and soul, under her mature voice, in the tradition of female songstresses like Tori Amos and Tracy Chapman, but without any excess. Lentz’s CD release show on March 28, the day the album’s officially out, came to be at Public Assembly rather by accident. Arriving at 70 N. 6th St., the Greenpoint-based musician was looking for Galapagos Art Space. In its place, having claimed into the space after Galapagos moved to DUMBO was the new venue. Between piano lessons, working as a musical director at a church on Manhattan’s Lower east Side and her 8-month old-son, that hasn’t left Lentz much time to devote to writing new music, though she looks to be able to sit down at her piano more. Sarah Lentz celebrates the release of her new album, “Begin Again,” on March 28 at Public Assembly (70 N. 6th St.) at 7 p.m. Tickets are $10. Kelley McRae Band is also on the bill. For more information, go to www.publicassemblynyc.com or call 718-384-4586. For more on the artist, go to www.sarahlentz.com.